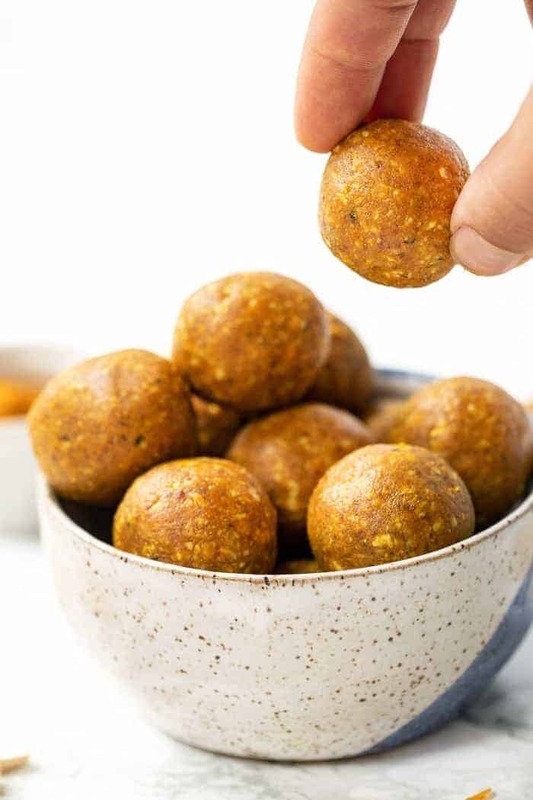 These healthy Golden Milk Energy Balls are the ultimate snack! Filled with complex carbohydrates, healthy fats and protein, they're balanced and delicious! I would be lying if I told you that I wasn't a snacker. Snacking is the name of the game, especially when I'm working from home, so it's important to me that the snacks I have around the house are actually healthy and filling. I've always been a chip and cracker lover but I realize most of those are fried and aren't adding anything to my diet nutritionally wise. Plus, they're mostly just simple carbs, so they go right through my system and I'm left hungry again an hour later. Which is precisely why I love having energy balls stashed away in my freezer! Energy balls are the perfect anytime snack. 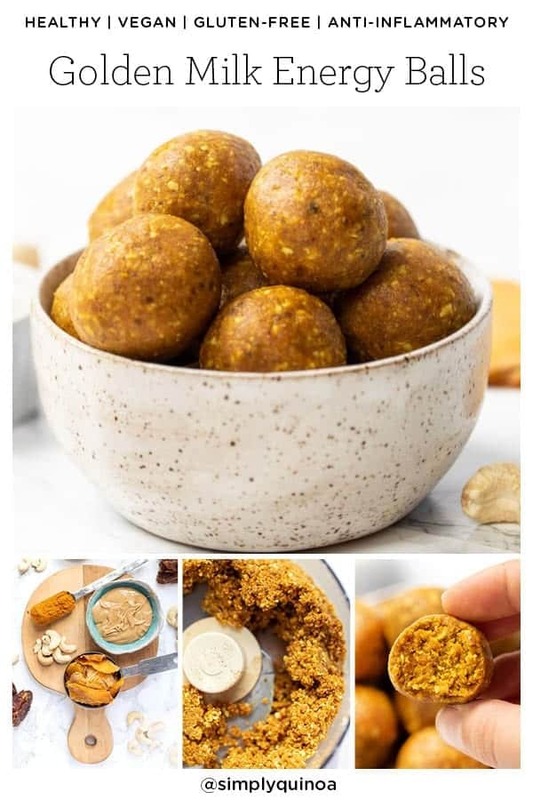 They're nutritionally balanced, they're easy to make, you can turn them into a million different flavors (check out my Ultimate Guide to Energy Balls to see), and they're actually filling. The reason why is that we combine all your macros into each little ball. We've got carbohydrates from the fruit, as well as protein and healthy fats from the nuts and nut butter. When you have a snack with a balance of each of your macros, you're left feeling much more satisfied, your hunger levels are more stable and you don't get a crazy sugar rush/crash later in the later. And get this: all we need to do is toss everything in the food processor and blend it up! I've made a ton of different flavors for you before, but these are a bit different for me. They use fewer dates than some of my other recipes are have a very distinct flavor. 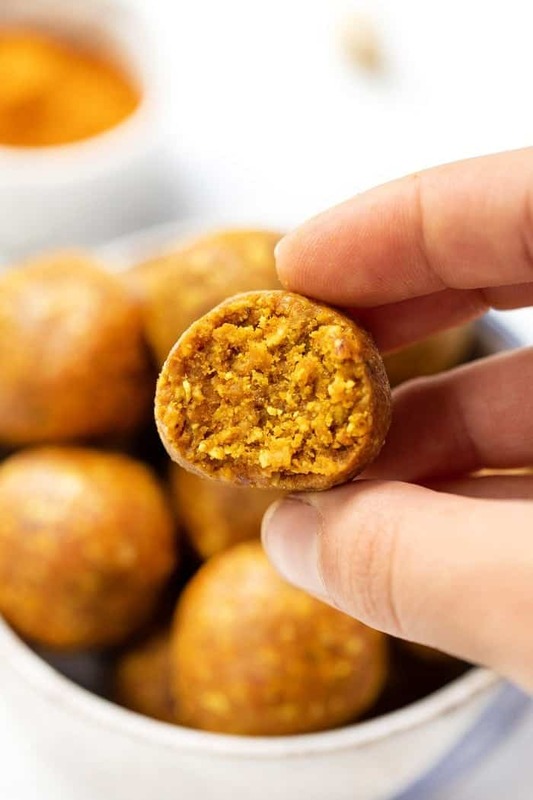 These golden milk energy balls taste like a golden milk latte, just in bite-sized form! Why Golden Milk Energy Balls Rock! Now, I will be honest and tell you: I am not the biggest turmeric fan. I find it to be rather bitter and very strong, which is why I don't often drink turmeric lattes. I just don't love the taste! But these I do enjoy. I find the turmeric is mellowed out a bit with the sweetness from the dates, and the mango adds a tropical twist that definitely shines through. 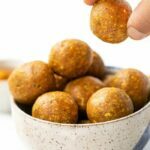 More Energy Ball Recipes to Try! 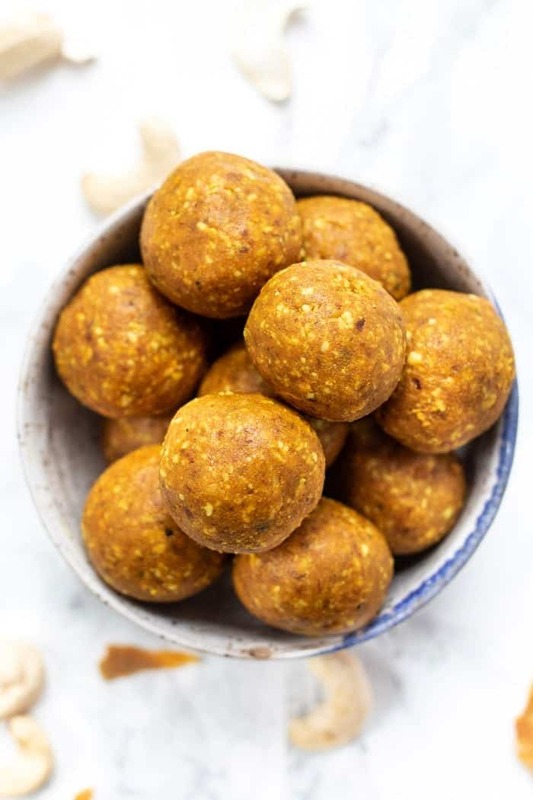 These healthy golden milk energy balls are the perfect snack for people who love turmeric lattes! You can take them with you on the go and don't have to worry about getting turmeric spills on you! 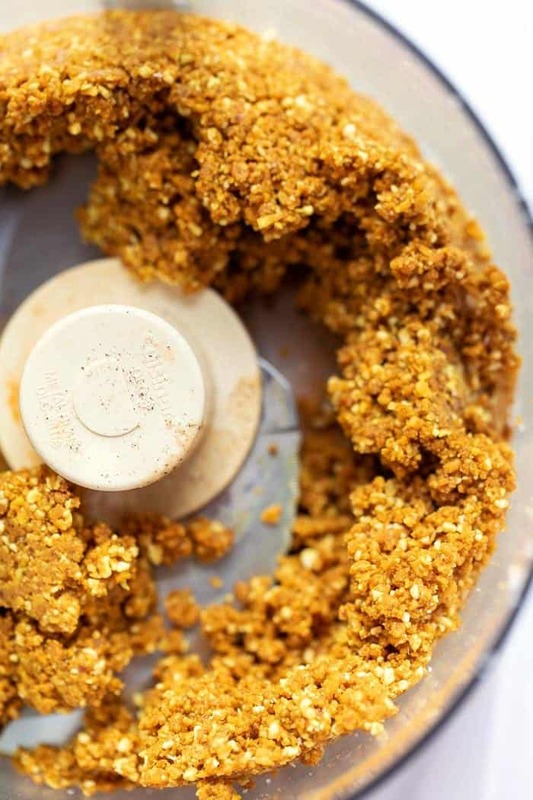 Add dates and mango into a food processor. Process on high until crumbly. Add in the rest of the ingredients and blend again until a dough starts to come together. If that's not happening, stream in water (or maple syrup) one tablespoon at a time until a sticky dough forms. Remove the lid and form the mixture into balls. Transfer to a plate, enjoy immediately, or for an even better texture, cool in the fridge for at least 30 minutes. don”t see any golden milk in the energy balls?? Is there a substitute for the dried mango? You could use more dates, but the color will change! 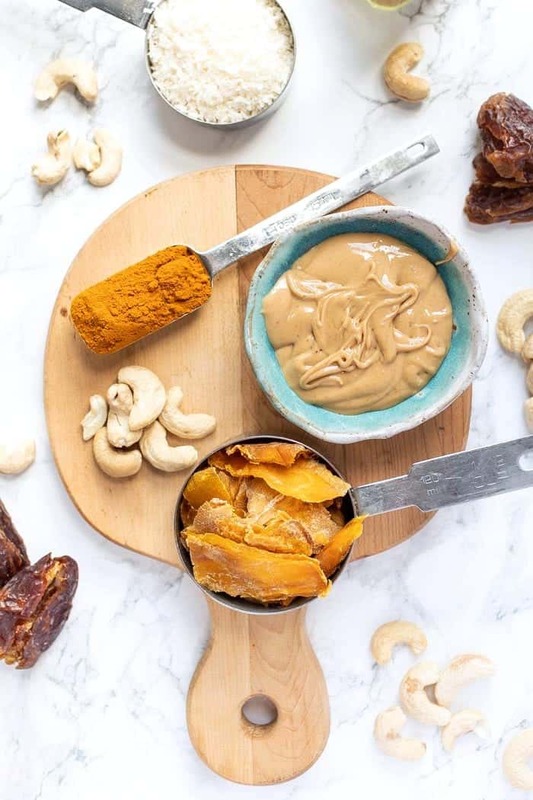 Do you make your own cashew butter and if so, how? Your help here would be appreciated. What do you recommend for people who don’t have a food processor? Finely chopping? Blending? You could try blending, but unfortunately, I’ve only ever tried making energy balls in a food processor! Could I substitute almond butter for the cashew butter? TIA.